Let your children have a fun bathing time!! Play it togther with parent !!! make your family full with happiness and these water toys can give your child a fantasic bath trip in safety! Easy to Take Out: Lightweight and small in size for you to take out for swimming pool or sea beach. Perfect size toy for babies Infants Toddler Kids little hands to hold. Fun new way to learn about colors and under the sea animals; enhances motor skills and imagination. 14Pcs in One Package of this bath toys set. Great for bath party favors, birthday, pool party, preschool party favors, thanksgiving day and Christmas. 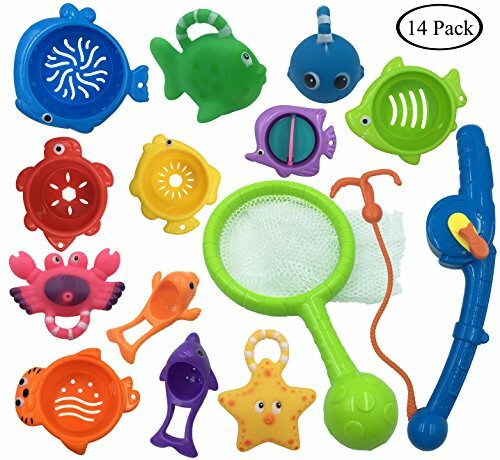 1.Super Value!14 pieces Bath toys, including 1*fishing rod, 1*fishing net, 4*squirts toy, 2*strain scoop toy and 6*Stacking Cups. great gifts toys for kids to play in bathtub or swimming pool. 2.Bright colors and cute appearance design!easy to draw your kids attention, fun bath toy to entice your child into taking baths. 3.As Educational Fun Bathtime Toys! these fishing toys and stacking cups are perfect for developing hand-eye coordination. Children will experience cause-and-effect relationships in the process of playing with friends or parents. 4.Perfect for Bath Toy! Baby Showers, Pool Party, Birthday, Preschool Party Favors, Carnival Game and Collecting. 5.Great Quality! Made with Durable Thick Plastic,100% Smell Free, Non-toxic, BPA Free,ensures children's health and safety. If you have any questions about this product by MOLICUI, contact us by completing and submitting the form below. If you are looking for a specif part number, please include it with your message.